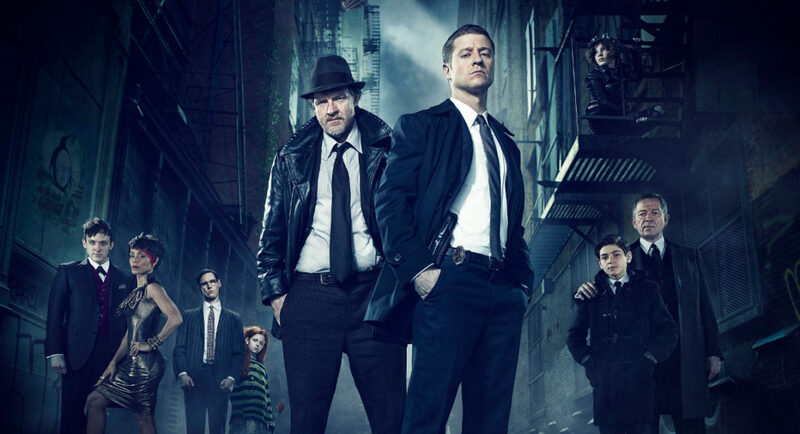 Gotham Review - TV FOX - Are You Screening? There’s been a flood of television shows that lean, to one extant or another, toward the sci-fi/fantasy realm, with varying success, and comic book films have been taking over the box office, so it isn’t very surprising that comic characters would return to the small screen, and with Supergirl now on the horizon, it doesn’t look like we’re turning back any time soon. The twist with Gotham, that does make it a bit surprising, and more difficult to judge, is that it is a sort of anti-comic series. It’s the prequel to Batman, and while that might be an area worth exploring, it doesn’t immediately open the door for knowing what you’re getting into by watching. 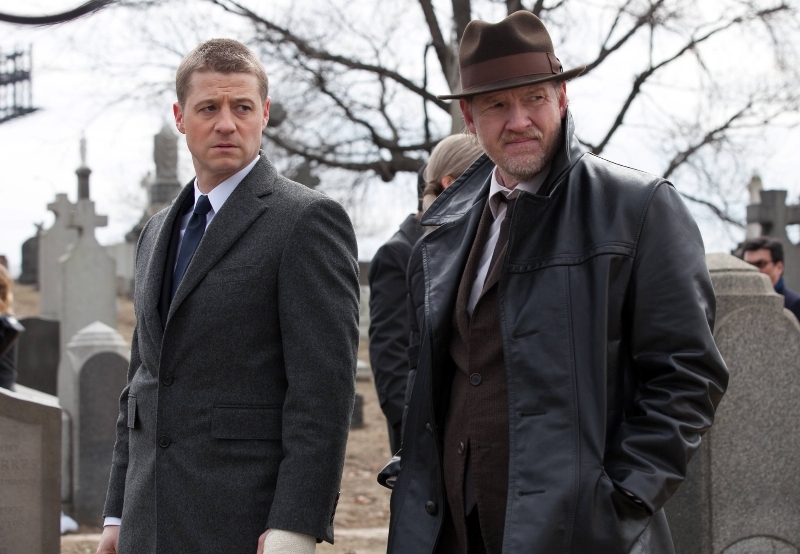 The series obviously begins with the death of Bruce Wayne’s parents, and rookie James Gordon (Ben McKenzie), and his new partner, Harvey Bullock (Donal Logue) end up with the case. It makes for a rough first day on the job for Bruce, because he not only has a high-profile murder to solve, but he is thrown into the lion’s den that is Gotham – gangs, crime bosses, and corrupt cops (like his new partner) included. While especially focused on Gordon, the series also hopes to deliver genesis stories for the villains that fill Batman’s world, and Penguin (Robin Lord Taylor), Catwoman (Camren Bicondova), and Riddler (Cory Michael Smith) make early appearances, with many more to follow. Our entry to the series follows the investigation into the Wayne murder, which leads us to Fish Mooney (Jada Pinkett Smith), a crime boss (who employs Penguin) who is a little too familiar with Bullock. The case moves along by way of the establishing moments the show needs to set the stage, but ultimately only leads Gordon to a more thorough understanding of the cess pool he’ll be dealing with for the rest of his life. It’s mostly style over substance, even during the moments that deliver the pilot’s major plot points and surprises. It isn’t so much that this is happening, but that this is the sort of thing that will happen. When we first walk into the GCPD precinct, or Gordon and Bullock walk into Mooney’s “lair,” or we go home to Gordon’s apartment, there’s a strange feeling to what we’re watching, as though this is not exactly an episode in itself, but a kind of super-trailer for the whole series. There’s nothing wrong with that necessarily, but it sets an odd mood, and is somewhat distancing. This combines with the obvious prequel hurdle keeping us from developing any tension, which is that we can’t manage to be nervous about anyone’s future. It’s a different kind of story we’re watching here, and the series has to do a lot of selling to get any investment. Luckily, the show has Donal Logue standing just behind, and slightly off-center from, almost everything that happens. McKenzie works well enough, especially in the beginning, but the show does better the more it seems like he isn’t quite up to the job. Odd as that may sound, and much as McKenzie has a certain charm, if he’s slightly out of his element, that alone sells the show as something working in a better realm. If he’s too comfortable, and we’re giving him work he can manage as well as could be hoped, then we’re on the CW, and there aren’t enough fans to carry the show. Logue, on the other hand, is the perfect, undeniably watchable figure to have for McKenzie to continually not quite be able to match. 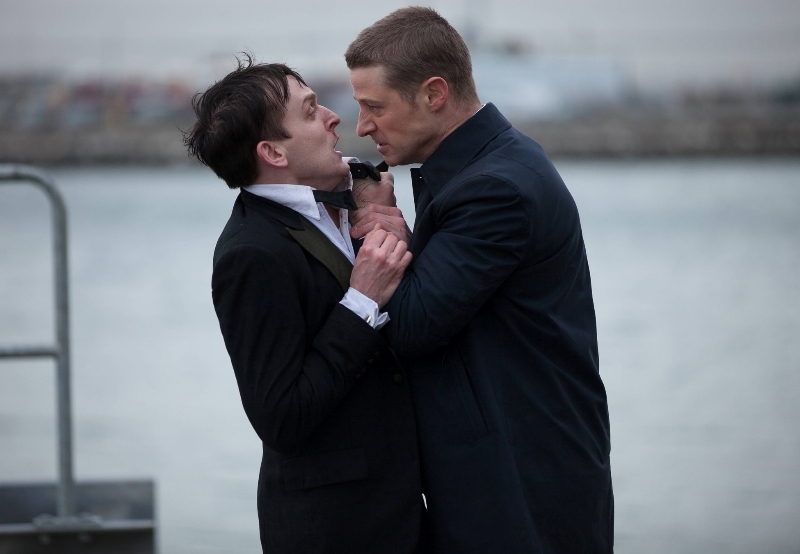 The show’s ultimate ability is probably going to depend on how well the supporting actors are able to deliver, and if Jada Pinkett Smith and Robin Lord Taylor are any indication of the future, the show is going to win out. They both pull off the comic/live crossover brilliantly, although the character Fish Mooney could easily go sideways in a hurry. The potential problems are legion, and the truth is that most of them show up, but the show is a lot of fun, and it’s daring enough to lay all of its cards on the table and admit what it is. Unlike Marvel’s Agents of S.H.I.E.L.D., which tries to be several different shows and doesn’t want to admit to being any of them, Gotham pulls its world together honestly, and offers up what it thinks works, come what may. It aims for a gritty, surreal landscape populated with people who aren’t exactly real, but have some depth, and it readily admits that if you look at things the wrong way, it’s a bit silly. Moreover, it’s clearly aware that it has to run that gauntlet to have any chance to come out the other side with something that doesn’t have to talk down to its audience, and can handle its characters with respect. The end result is something that feels a lot like Batman Begins, not just because it adopts a similar visual style, but because it’s after the appeal of mythology that sells comic books in the first place.